Summary: Daily contact lenses have different designs that are meant for different purposes. Many people ask this question because there are two different types of “daily” contact lenses. There are daily disposable contact lenses and daily extended use contact lenses. There are significant differences in the way that these lenses are designed and how long they can be used safely for. Daily disposable contact lenses should only be worn for one day only. They are designed as a single use lens that is not resistant to bacteria, germs, or other buildup that collects on the lens throughout the day. These lenses are commonly sold in large quantity boxes that hold up to 180 lenses per box. They are built to be much thinner, therefore allowing the user to feel more comfort and breathability. 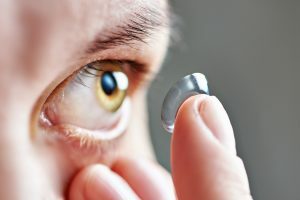 Now, many users will attempt to wear these contact lenses longer than they should by cleaning them in a disinfecting solution and wearing them for multiple days, or weeks. As stated before, the material of the lens is not made of a matrix that allows for cleaning, like you would with monthly contact lenses for example. The process of cleaning these lenses is generally ineffective and will actually break down the lens itself, much like a paper plate after it is soaked in water. Daily wear contact lenses on the other hand, can be safely cleaned and disinfected for 2 weeks to a month before discarding. These specially-designed lenses are meant to worn during the day only, but can be safely reused for up to a month. Be sure to check with your eye doctor and the daily lens manufacturer to find out the recommended wear time, as not all types of lenses can be used for up to a month. Blog submitted by Lens.com: Lens.com can help you find the lowest-priced bifocal contacts and other lens types with ease. Visit them online today for more information.